Munster was a true Renaissance polymath: a theologian, mathematician and linguist as well as an important cartographer. He is famous for his 1540 edition of Ptolemy's Geographia and his own Cosmographia, published in 1544. Both works went into several editions during Munster's lifetime and continued to be published posthumously. Born in Ingelheim, Germany, in 1489, Munster studied first at Heidelberg under the Franciscans. There he met Martin Luther and was converted to Protestantism. Moving on to Tubingen, he learned Greek from Luther's assistant, Melanchthon, and mathematics and astronomy under Stoffler, continuing his study of the latter in Vienna. His scholastic achievements were noted by the Swiss reformer, Johann Oecolampadius, who recommended him to teach Hebrew at the University of Basle, a position he held from 1529 until his death in 1552. Even while studying in Heidelberg, Munster had engaged in a cartographical project. His first map, of Germany, was printed in 1525. A few years later he married the widow of his printer, Adam Petri, thus cementing his partnership with the prestigious Basel printing firm. His stepson, Heinrich, subsequently published most of his work. 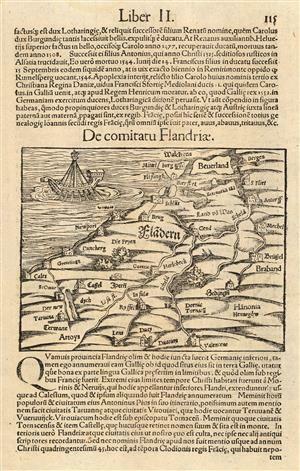 Of the leading cartographers of the sixteenth century, Munster had probably the biggest influence in spreading geographical knowledge around Europe. His Cosmographia contained both up-to-date maps and views and an encyclopedic range of information on the known world: it was probably one of the most widely read books of the age. He was also the first to produce separate maps of the four known continents, and the first to produce a separate map of England. Munster died of the plague in 1552.